How many of us have had that “late night craving” that ended up sneaking into the fridge and binging on anything remotely appetizing? Not knowing that you’ll wake up the next day with uncontrollable heartburn and frequent trips to the bathroom. Well that’s what happen to Vol fans as they approached Tennessee’s matchup with Florida, who had just recently had a 30 year streak of beating Kentucky squashed by the much improved Wildcats team. Tennessee’s chances looked good right up until kickoff. The Vols came out looking like a team thrown together who hadn’t played a snap in years, quickly fumbling away any chances of beating Florida again at Neyland Stadium. The mistake prone team found themselves in a quickly lopsided game at 33-3 just into the 3rd quarter. 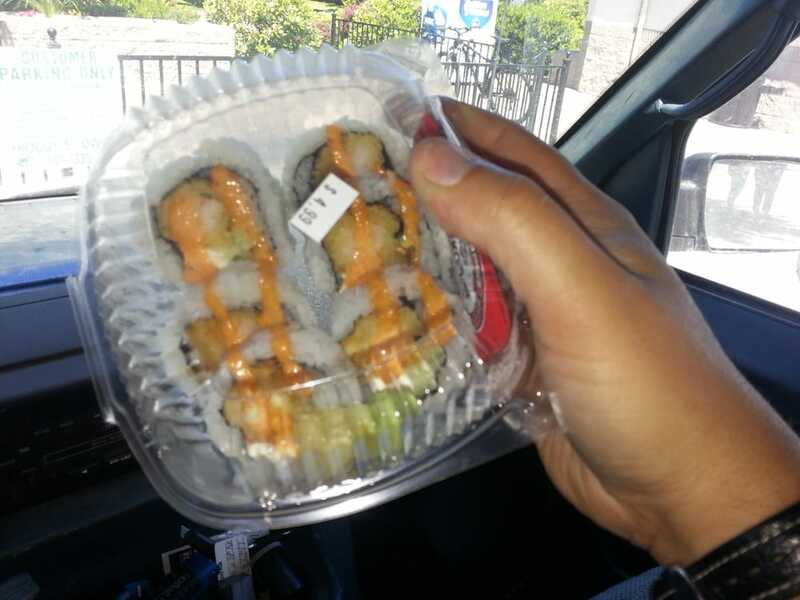 The gas station sushi showed its ugly head as Vol fans suffered mass nausea watching their beloved team give away any chance of a close game to Florida. Would they have had a chance anyway? Probably not as Tennessee is in yet another “rebuilding” year under Pruitt with players recruited by Butch Jones. Players that were marketed as the real deal but are showing they couldn’t live up to the hype. The game sparked a couple controversies, one being between head coach Pruitt and Quart’e Sapp which was quickly squashed in the days following the game. The other of coach Pruitt kicking a dry erase board on the sideline in obvious frustration at the team and their lousy performance. National media quickly jumped on this as if Pruitt was over his head taking on the job at Tennessee. Personally I would of preferred Pruitt go “Bobby Knight” style and using the dry erase board to break over player’s heads in any attempt to light a fire under a team not willing to “give their all for Tennessee”. Imagine for a moment, Nick Saban being the head coach of that team…. Now what would he of done? With Pruitt having plenty of experience under Saban and Kirby Smart, his actions on the sideline proved that he is passionate about getting this team together and making them at least competitive in 2018. With the real meat of the SEC schedule starring down at the Vols. Pruitt better hope he can get that team together sooner than later, otherwise Vol fans will see their beloved team again have zero wins in the once dominated SEC. With a lot of expectation and years of previous frustration, there is no describing how hungry Vol fans are to finally turn the page of an epic tragedy in the Tennessee Volunteer story. It would be delusional to expect this team could be turned around in one year by any coach. 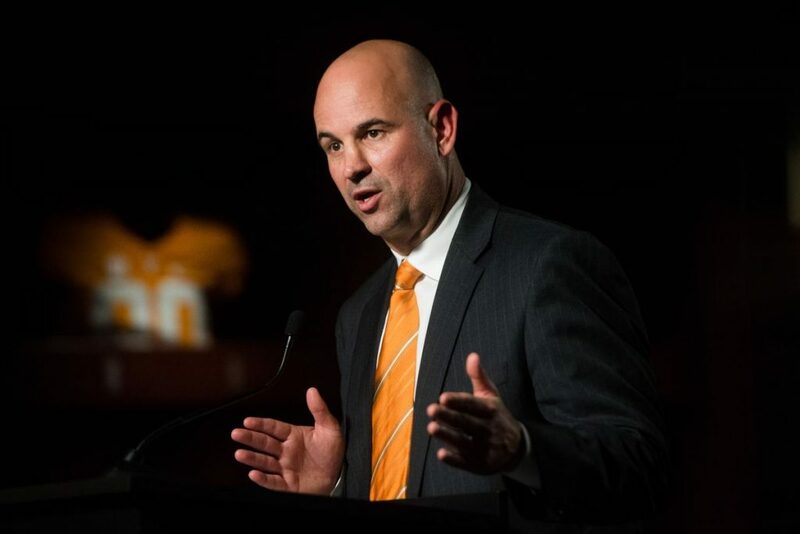 New coach Jeremy Pruitt has started off his head coaching career at Tennessee saying all the right things. Vol fans are once again starting a season with skeptical optimism or complete indifference and some claiming we’re ready to strike fear in opponents. Optimism came crashing down to reality quickly from the start of the Tennessee vs West Virginia game. Tennessee looked like the same team in 2017 with a horrible start to the game against 17 ranked West Virginia. Granted it is the first game for Coach Pruitt with a majority of the team being his predecessor’s recruits but it quickly looked like a team that was no where close to being ready for prime time. The offensive line, which needed much improvement, was still a long way off from effectively blocking and giving Guarantano time to make plays as quarterback. Having tapped Guarantano as starting quarterback over senior transfer Kelley Cryst left a lot of fans scratching their heads having seen Guarantano’s play last season. That was only exacerbated by his performance in this game passing for only 172 yards and having only one passing play over 20 yards for the Vols. Guarantano just has been unable to go through his progressions as quarterback and deliver consistent offensive series in games. It’s always been said that the most like person on any team is the backup quarterback. Cryst may emerge from that roll in the next couple games if Pruitt decides to test drive him for ETSU and UTEP. The running game seemed to have its moments which pleased Vol fans who have been clamoring to get back to “Tennessee Football” and was one of the key talking points when Pruitt was hired. Tim Jordan was successful in putting up 118 yards in 20 carries and 1 touchdown for the Vols. To Pruitt’s credit, he took full responsibility for the loss saying “How your team plays tells you what kind of coach you are, and their team played better than our team today — so that’s on me”. Something Butch Jones never did – Own it!! That will be put to the test after ETSU and UTEP as Tennessee embarks on a brutal 5 SEC game slate against all ranked opponents. Having gone 0-8 in the SEC last year, Vol fans are left wondering if we’ll even make a bowl game this year and how long will their patience last for Pruitt to get out of the hole that has been dug in Knoxville over the past decade. 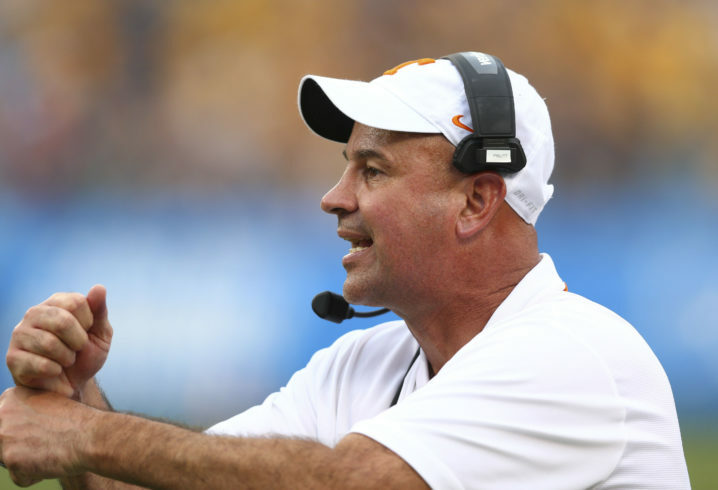 With the chance to steer Tennessee in the right direction, new head coach Jeremy Pruitt didn’t waste much time saying he was going to restore Tennessee back to the good ol’ days Vol fans have been hungry for. Pruitt a long time high school coach and college defensive coordinator sold Athletic Director Phillip Fulmer that he was the right man for the job. Having played as a defensive back at Alabama under Gene Stallings and eventually rising through the coaching ranks at Alabama, Florida State, and Georgia as defensive coordinator. Pruitt’s defenses were consistently ranked in high in college football. But is he the right man for the job? At this point Vol fans would almost except a sophisticated chimpanzee as head coach being denied any relevance in the SEC or nationally since Phillip Fulmer was fired as head coach. Last year, under Butch Jones, Tennessee saw their first season in history with zero wins in the SEC and have been ranked at the bottom of the SEC East for a decade. While “getting back to Tennessee Football” may sound like a great thing, how much patience do Vol fans have to let Pruitt get us there if he’s able? However, Pruitt has inherited a mess at Tennessee. Despite winning seasons and bowl appearances, Butch Jones failed as head coach to develop any of his top ranked recruiting classes to give Pruitt any shot at a quick turn around in Knoxville. Vol fans have watched as players left the college ranks to the NFL only to dominate in their positions once they were developed by NFL teams. No question that development was a key ingredient missing at Tennessee and has what led us to throwing Pruitt into the Big Orange Abyss and pray for a miracle. No miracle will come early enough for Vol fans but they will have to give Pruitt time. The only way out of this abyss is to recruit your way out and develop with a robust strength and conditioning program along with the right players for the right positions. Only time will tell as we wait for the 2018 season to begin but any hope for Tennessee should be tempered for at least 2 to 3 years before we see what Pruitt can do for the Vols.